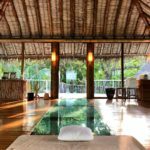 Hidden among dense foliage within the Baa Atoll UNESCO Biosphere Reserve, Soneva Fushi inspires the imagination. 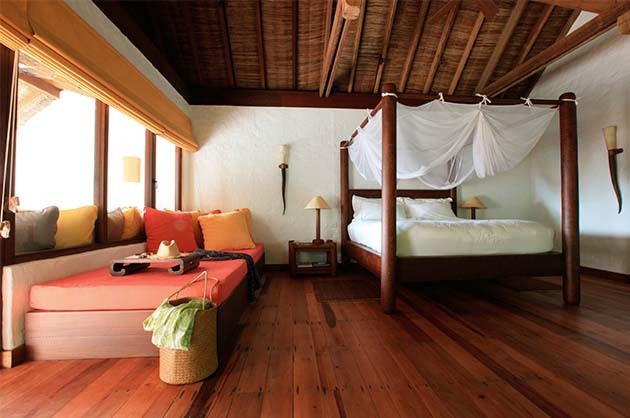 The award-winning resort truly defines the essence of barefoot luxury with Robinson Crusoe simplicity. The resort’s down-to-earth personality is reflected in its nature-inspired architecture. 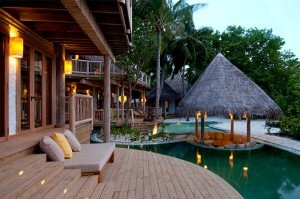 Soneva Fushi Maldives is the original desert island hideaway. 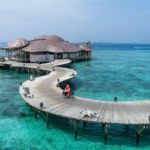 A jewel of an island – large by Maldivan standards – with perfect beaches, a vibrant reef, a colony of nesting turtles and its very own world-class observatory. There are few more beautiful locations on earth. 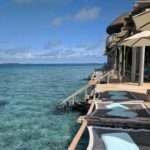 Vast, multi-bedroom luxury villas and private residences are hidden among dense foliage within touching distance of a pristine, Biosphere UNESCO protected coral reef, making it the perfect resort for diving enthusiasts. Intuitive service is provided by Mr./Ms. Friday butlers who know what you want before you want it. Every visit makes you feel young again. And children are well looked after too. Cycling around the island, never knowing when you might have to swerve to avoid bunny rabbits or lizard. Watching movies in Cinema Paradiso, counting Saturn’s rings in the Observatory. Deciding between sixty flavors of ice cream. Eleven types of pillow. Five hundred different wines. 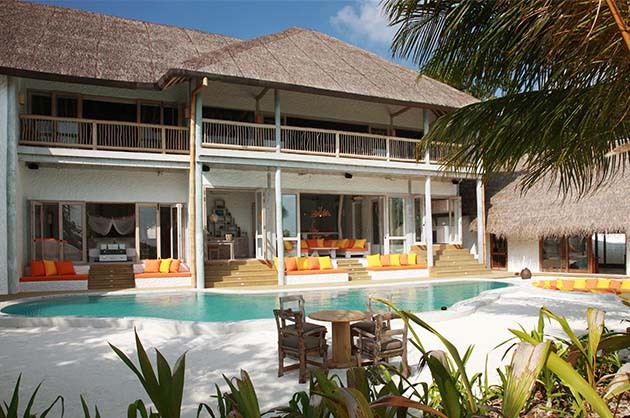 Three to nine bedroom villas. And nine dining options too. 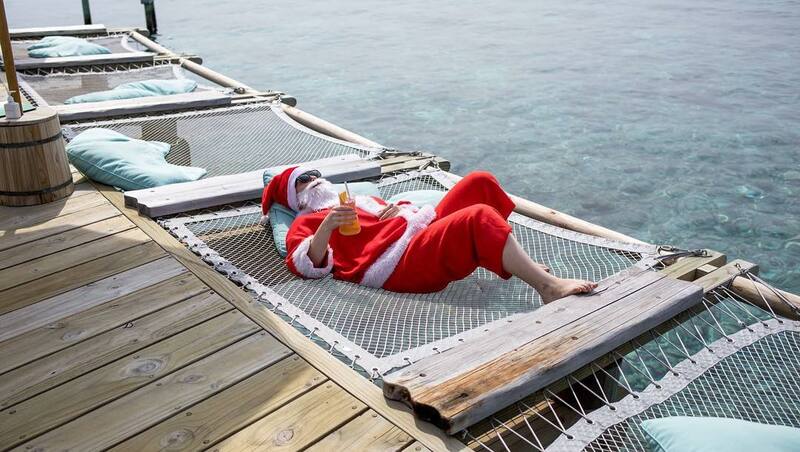 If the experiences are magical, the philosophy is simple: No news, no shoes. No pretensions either. 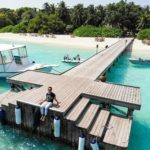 The Soneva Fushi Maldives Robinson Crusoe castaway experience inspired us in terms of name and design. 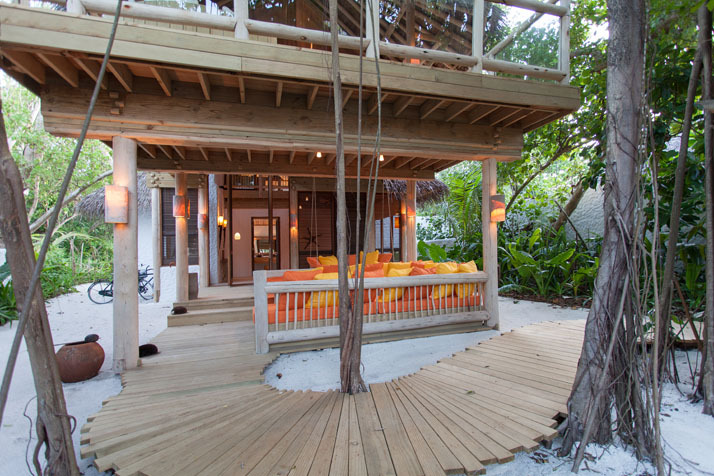 Walk the rope-tied gangway leading to your tropical terrace. Shower beneath sun or stars in your garden bathroom. 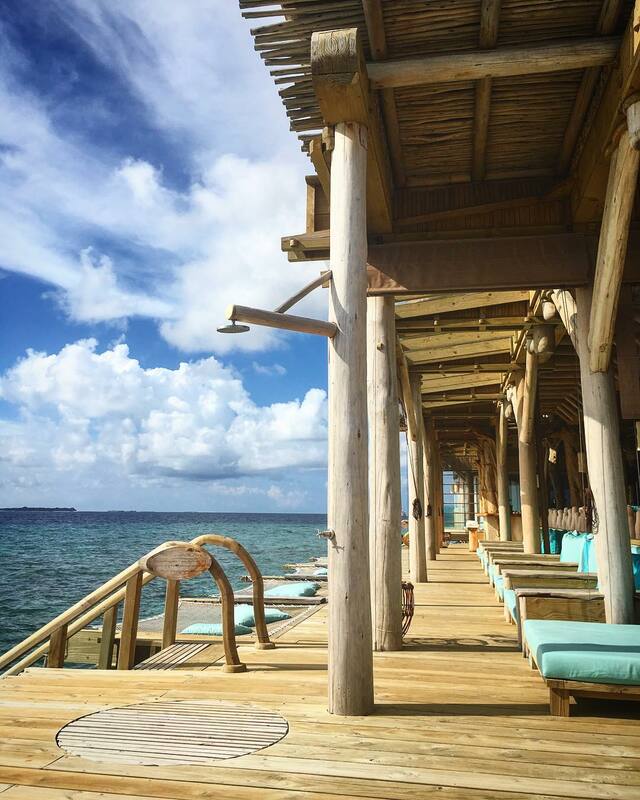 The beach is at your doorstep. Tucked amidst the greenery on the island’s white sands, nature surrounds your private sanctuary. 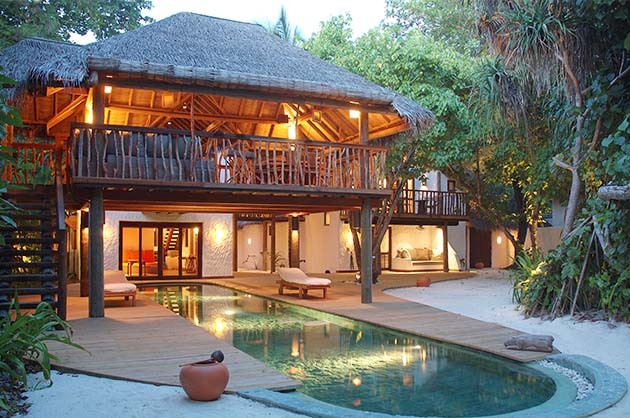 Perch over your private pool, sheltered in the trees, or take a dip in its refreshing waters. 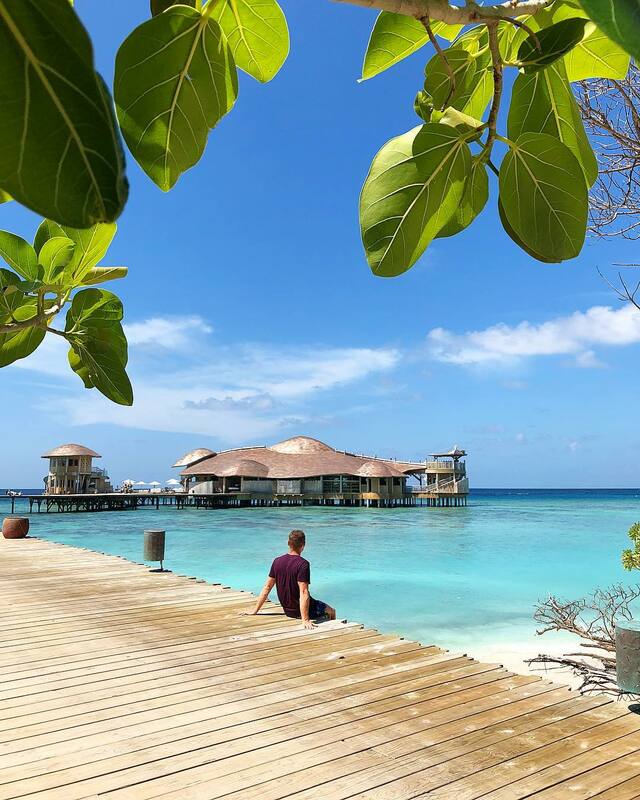 The clear Maldivian ocean awaits only steps away, if you fancy exploring its underwater wonders. 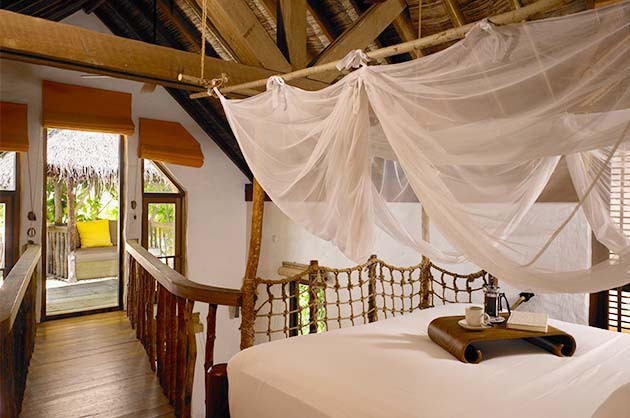 Relax amidst the playfully rustic-chic rooms and terraces and give in to the castaway spirit. 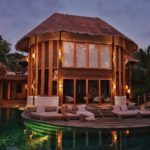 Designed this villa with tropical whimsy: raw wood that retains its gnarls and bends, woven ropes, recycled planks, and palm thatch. 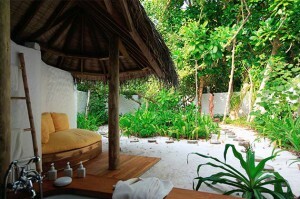 The outdoor garden bathroom brings nature closer as you bathe in starlight or the sun’s rays. 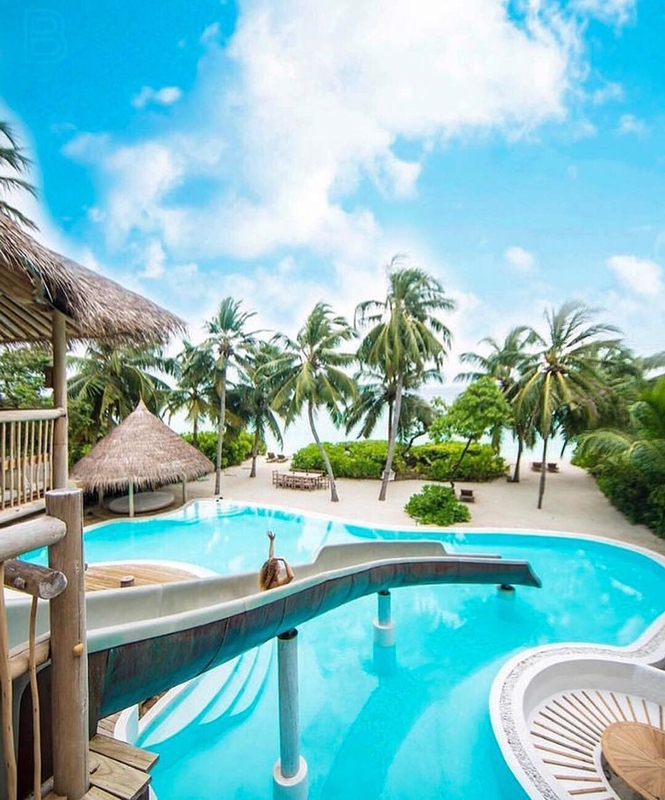 You and your family can relish the Robinson Crusoe spirit as you laze amidst its terraces on levels high and low, splash in its private pool, or lounge on the beach right outside your doorstep. 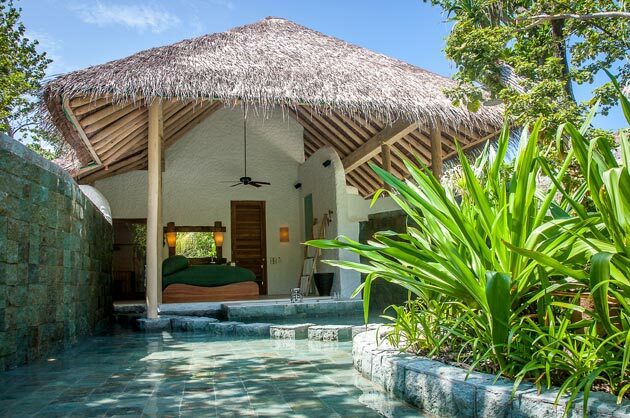 Our favorite spot in this villa is the large, luxurious open-air garden bathroom. 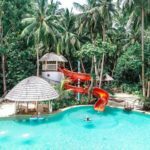 Soak in the oversized bathtub surrounded by lush greenery, or shower by starlight enjoying the cool night breeze. 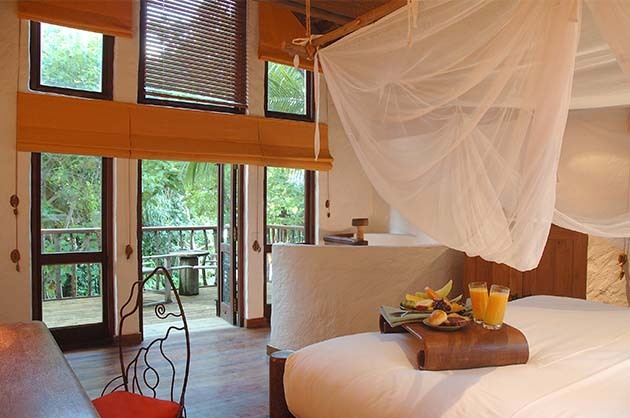 Then drift to sleep on the soft cotton sheets of your four-poster canopy bed. 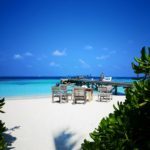 Awaken to morning’s early rays and step directly onto the Maldivian white sands of the beach right outside your villa. 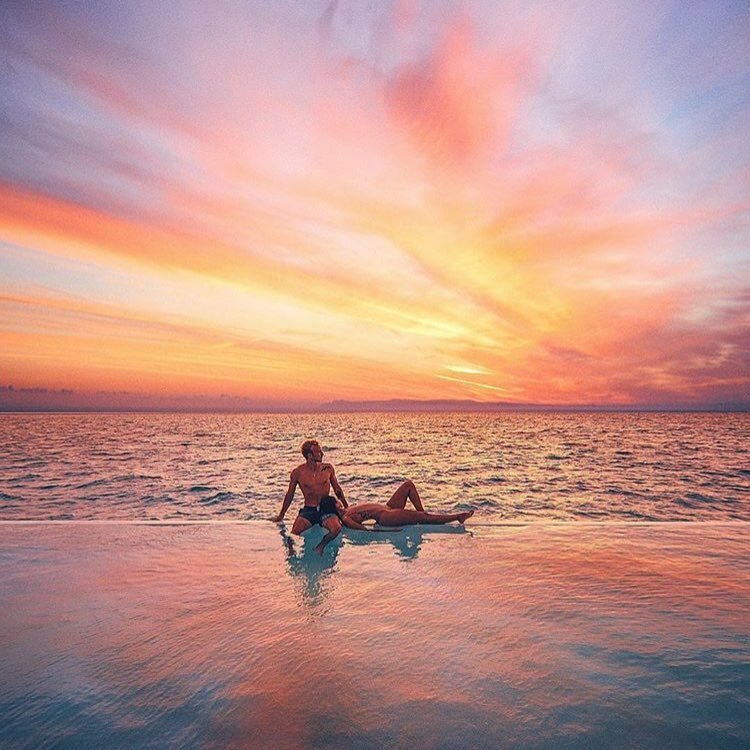 The most important experiences in life are those you share with the ones you love. 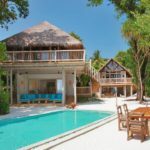 We designed this luxury two-bedroom Soneva Fushi villa to set the stage for such magical memories. 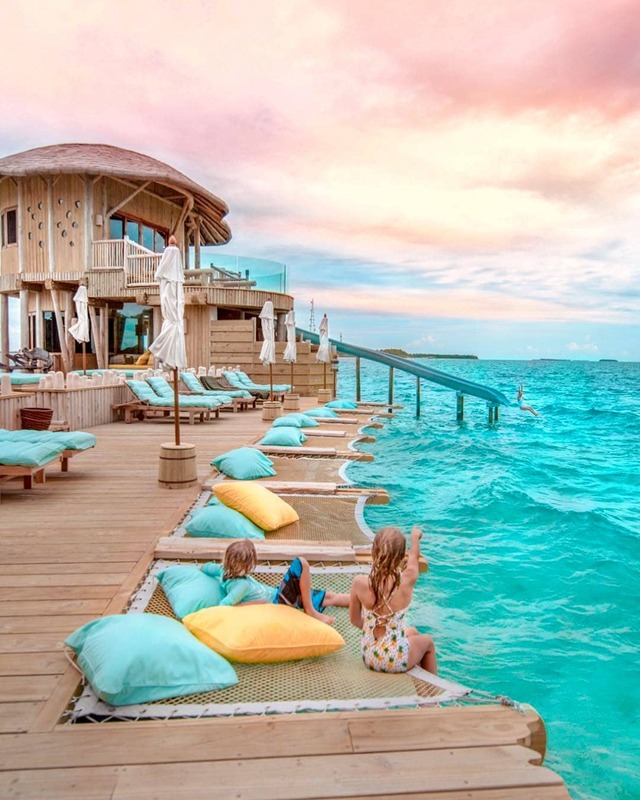 Savor moments together as a family in your private seawater pool. 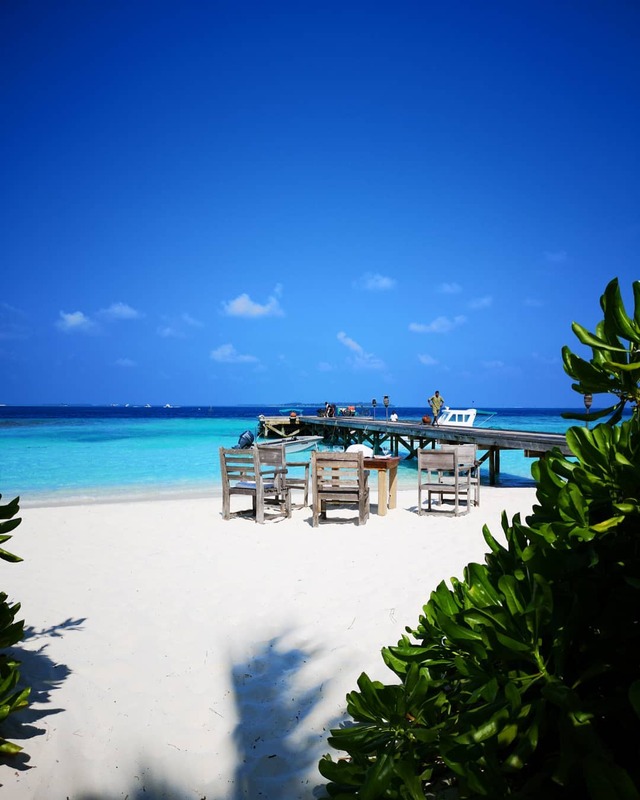 Set directly on the beachfront, the bounty of Maldivian nature is at your beck and call. 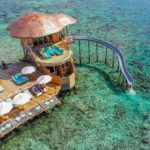 Snorkel the clear waters, introducing your children to the amazement of the underwater world, then retreat for romance in your open-air garden bathroom sheltered by whitewashed courtyard walls and the lush greenery. 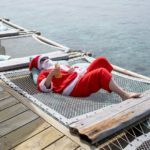 Sometimes on holiday, we wish to go out and explore, and other times we take advantage of the opportunity to shelter ourselves away. 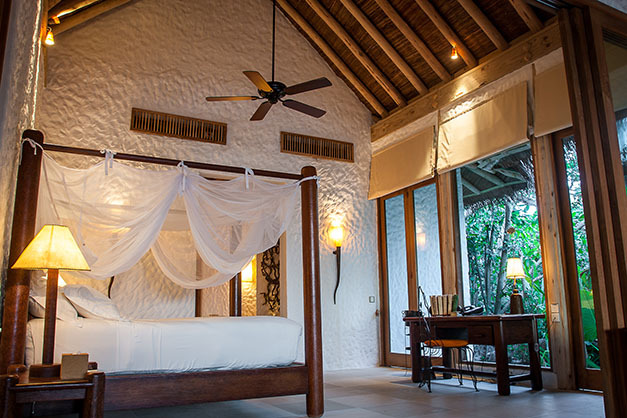 As we created this villa, we ensured that it would be the perfect enclave for a romantic escape. 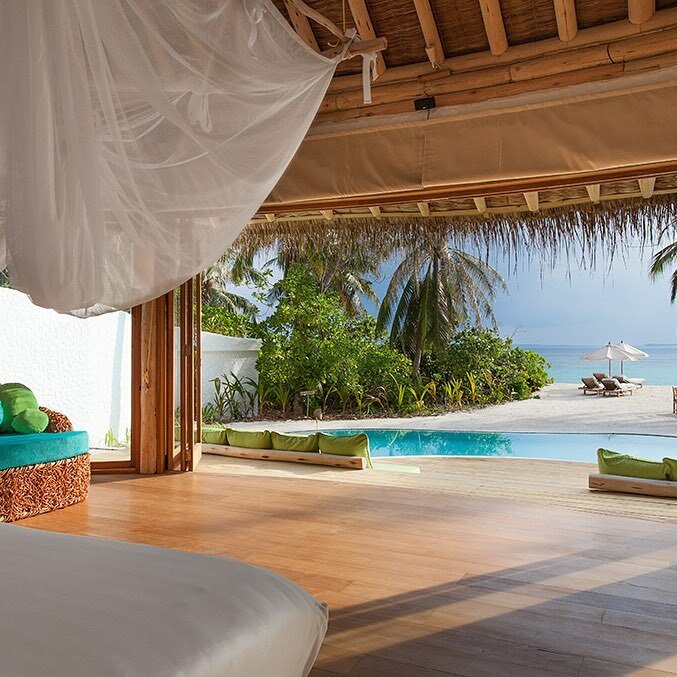 We encourage you to go out and explore the island’s wilds and carefully curated luxuries, but should you wish to stick to your hideaway, you have luxurious space in the Soneva Fushi Villa Suite with Pool. In addition to your spacious bedroom with its soft king-sized canopy bed, you have reign over a separate deserted-island chic sitting room, outdoor sitting areas, cushions and daybed, extravagantly large open-air garden bathroom and private pool – as well as the Maldivian white sands and crystal waters of our house lagoon, direct from your beachfront villa suite. 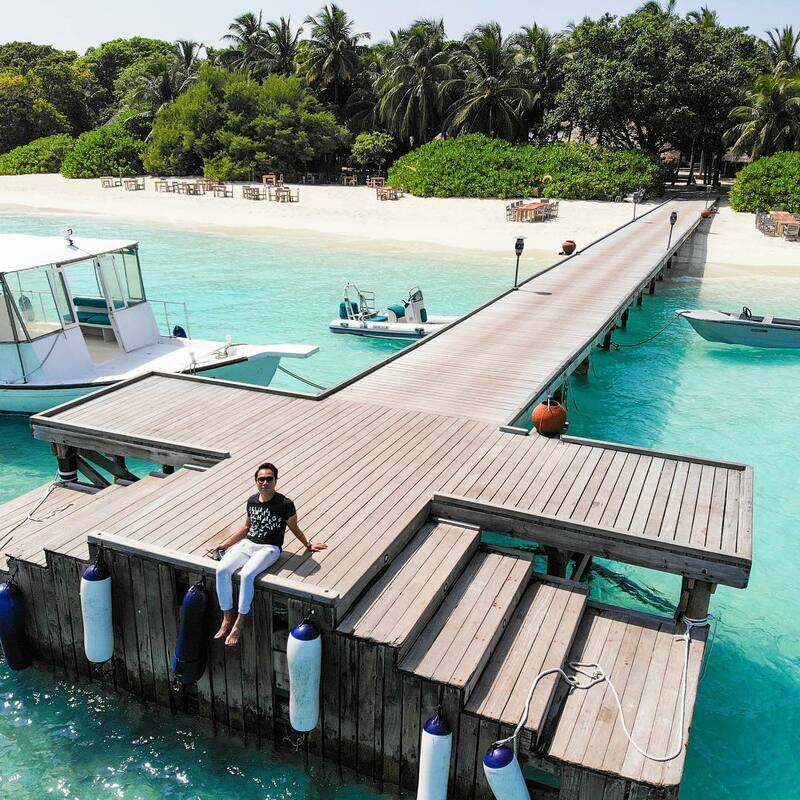 Who would not love to be shipwrecked on a lush magical isle like Soneva Fushi Maldives? 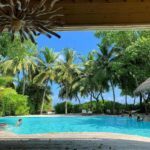 We have even taken care of the hard part for you; the thatched roof has been woven, the beams hewn, the hammock strewn, your own “lagoon” (a private swimming pool) dug and tiled. All you and your family have to do is enjoy it. 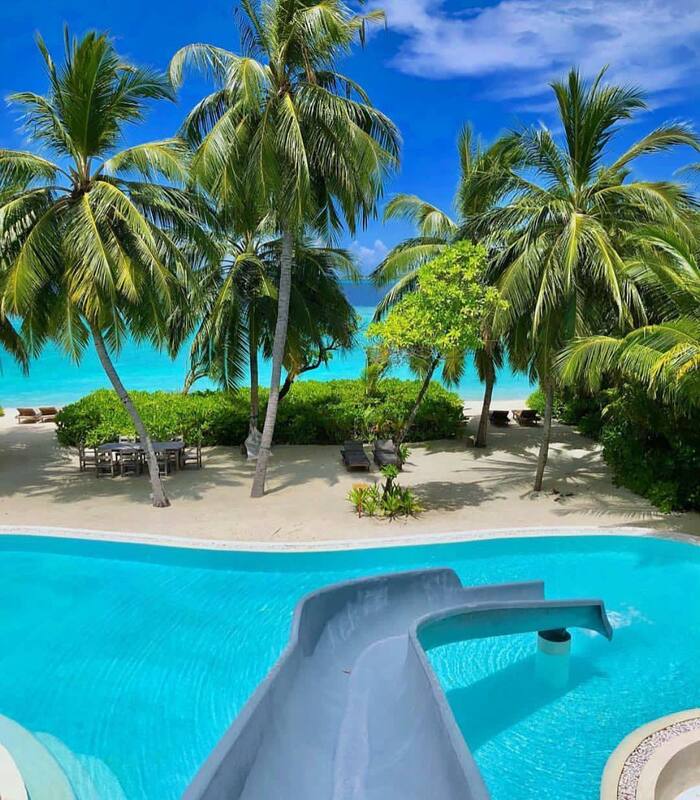 Frolic in your spacious Two-bedroom Soneva Fushi Villa Suite and its refreshing pool. 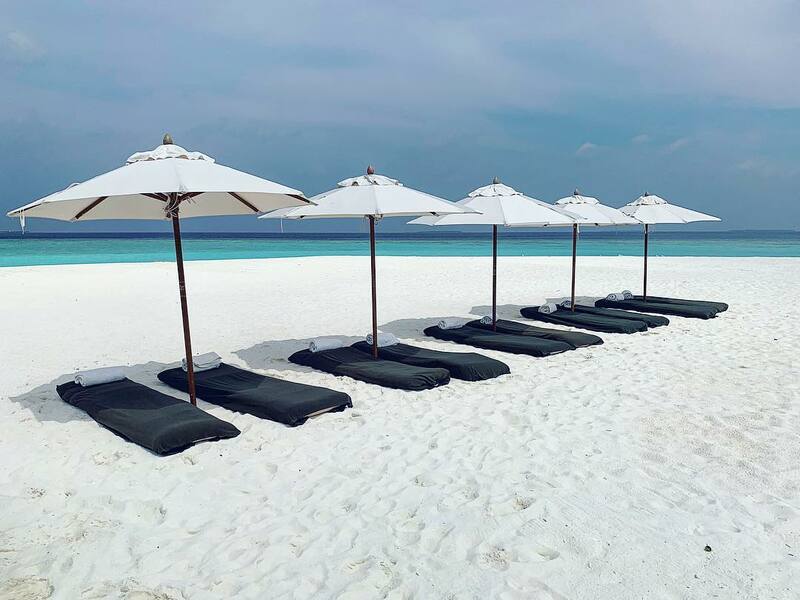 Hit the Maldivian white sand outside your door; we have placed your villa suite directly on the beach. Or take to the bicycles we have provided for you at your villa and explore the island trails. 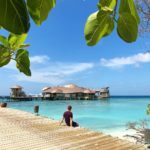 Sometimes on holiday we wish to go out and explore, and other times we take advantage of the opportunity to shelter ourselves away. As we created this villa, we ensured that it would be the perfect enclave for a romantic escape. 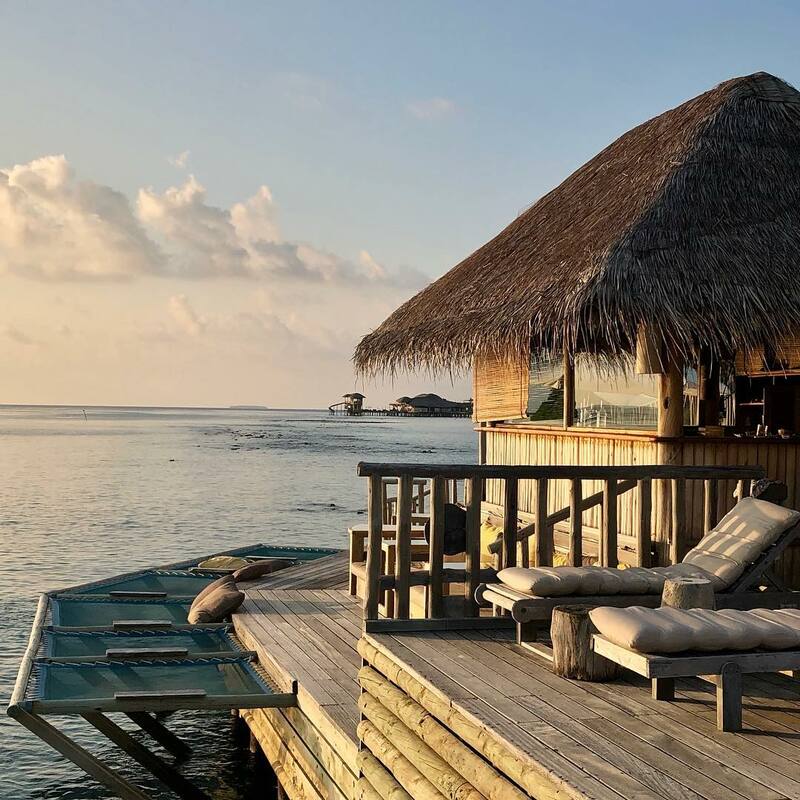 We encourage you to go out and explore the Maldivian island’s wilds and carefully curated luxuries, but should you wish to stick to your hideaway, you have luxurious space in the Soneva Fushi Villa Suite with Pool and Treehouse. When Robinson Crusoe washed ashore, he encountered a wild world full of discoveries. We offer your family a similar burst of excitement in this playfully indulgent luxury suite. 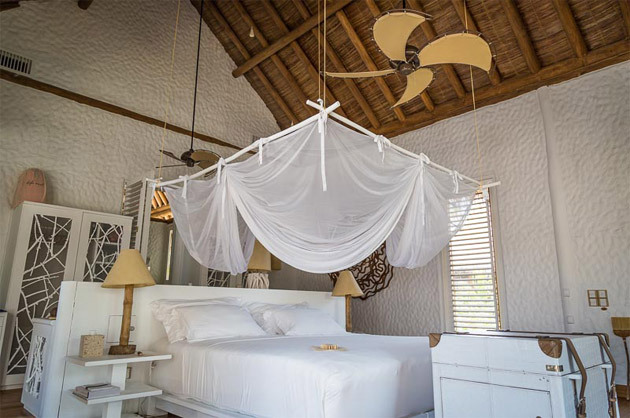 Upstairs and downstairs bedrooms, a choice of sitting areas on high and low, a swimming pool of your very own, direct beach access, two lush open-air garden bathrooms, personal bicycles for island exploring and more. Anticipate discovering your own favourite spot. Ours? 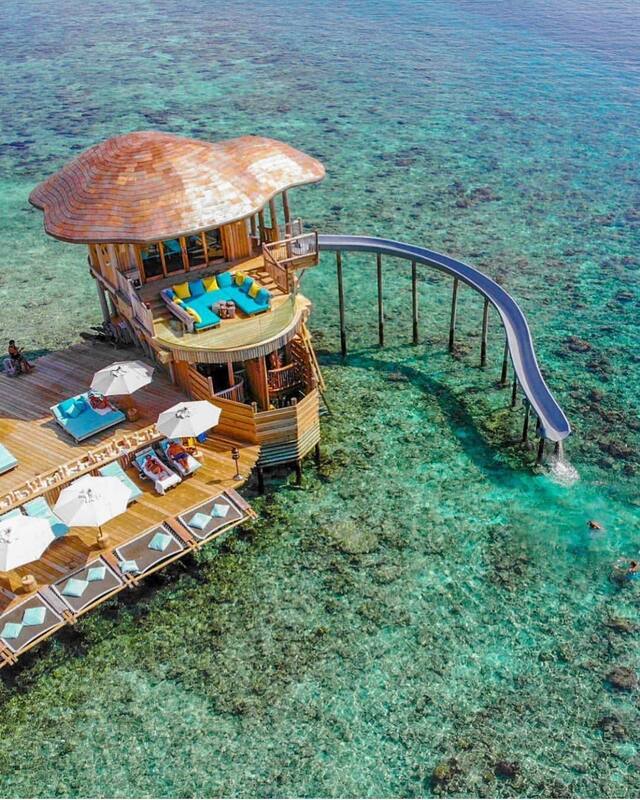 The private balcony reached via the gangway off the upstairs bedroom. 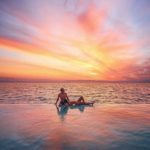 Watching the sun descend below the horizon, we knew we’d found a special place – one that called for a beautiful hideaway where a family or group of friends could enjoy this spectacular Maldivian location in total privacy. 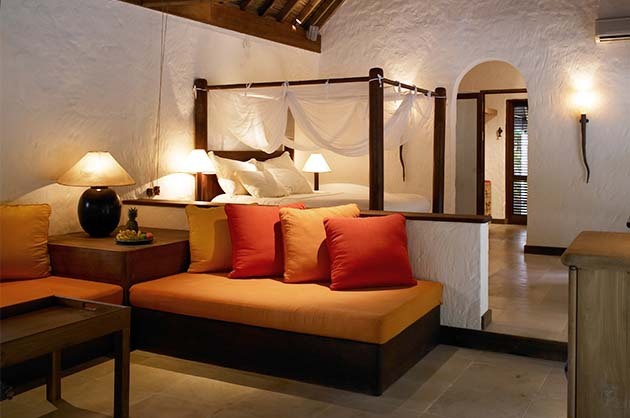 Our Three-bedroom Crusoe Suite with Pool offers this – and a little more. 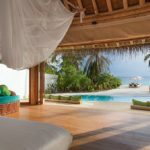 An expansive beachfront suite with a two-storey and separate one-story villa, the whitewashed walls and thatched roofing blend perfectly with the stunning setting. Open-air bathrooms offer the allure of nature meets luxury. 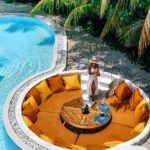 And then there is your own pool and outdoor sitting area – perfect for those days when all you want to do relax in your sanctuary, enjoying the personal butler service of Mr. or Ms. Friday. There is something magical about sunrise over the ocean. The swirl of colours. The quiet of early morning. The day full of possibilities. 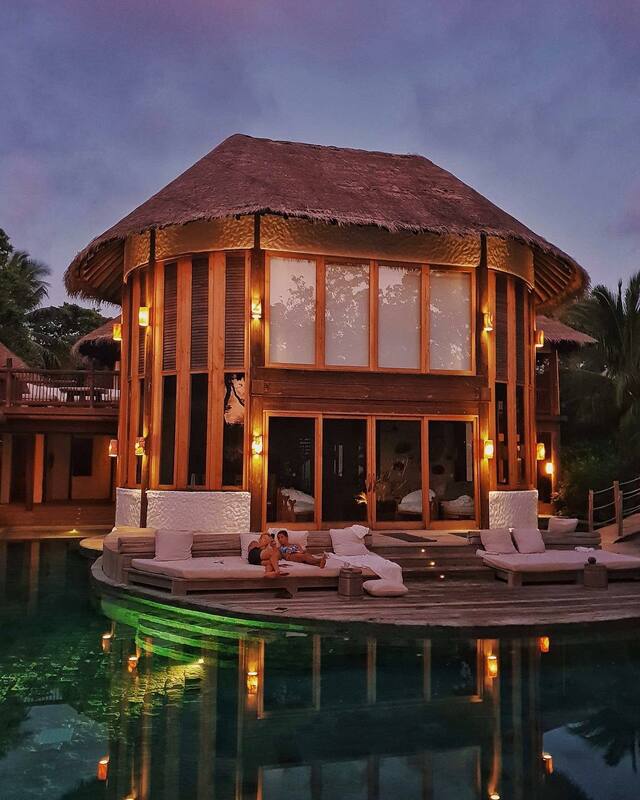 And the possibilities really are endless in this sprawling luxurious retreat we have placed on one of the island’s best stretches for taking in the dawn spectacle. Three bungalows, each two storeys, make up the retreat – though each features its own individual surprises. Promenade the suspended walkway. 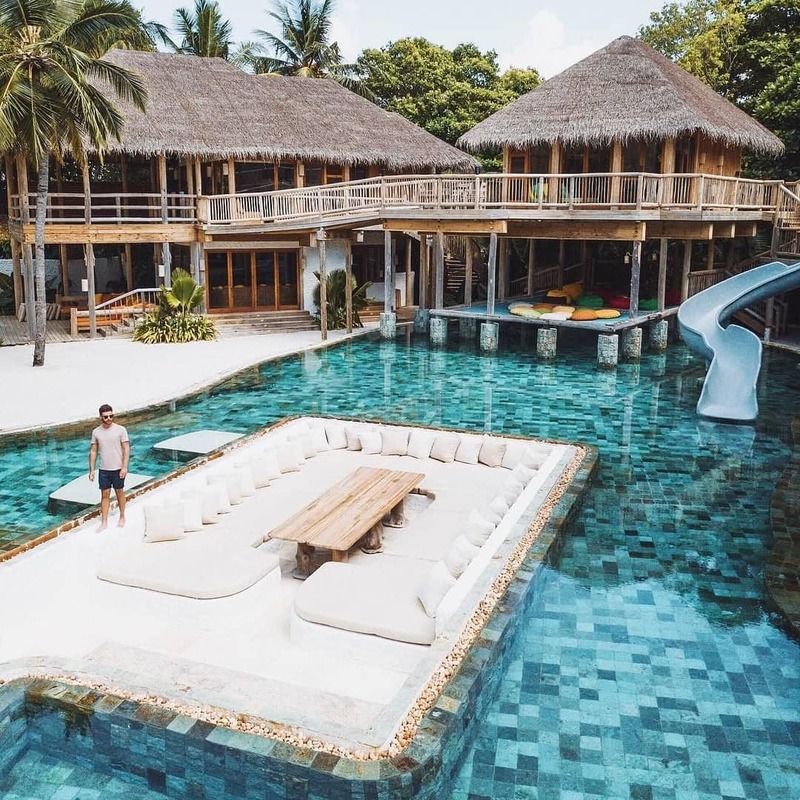 Swim the elongated pool. Bathe in the moonlight in the open-air garden bathrooms. Share a gloriously leisurely meal within your elevated dining pavilion, plucking bottles from your in-villa wine cellar. Some of us are early risers, taking in the dawn and its peaceful atmosphere. And others of us revel in the spirit of the evening, leaving the early hours for the birds. 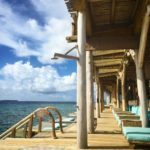 We created the Sunset Retreat more for the latter set – though absolutely everyone will enjoy its luxuries. With this retreat, we offer you two luxury bungalows of two-storeys each. 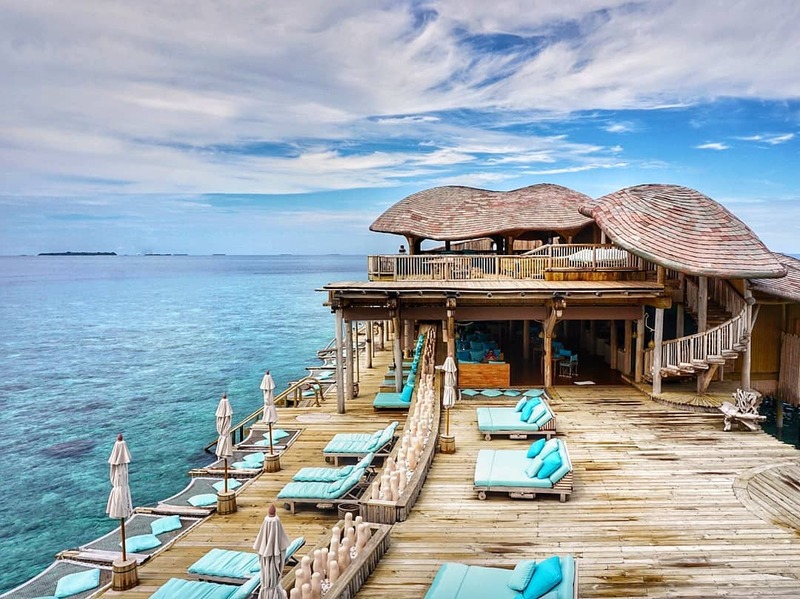 Incredibly spacious, within its walls and sprawling outdoor spaces you will find balconies with breathtaking views, a raised dining pavilion, wine cellar, steam room, gym and a private swimming pool to float away your cares or splash away in tropical surrender. The name reflects its premier status. 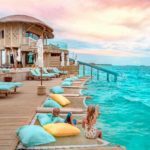 When we saw this private point on our island, we knew it deserved one of Soneva Fushi Maldives ultimate villas, and our guests share our passion. 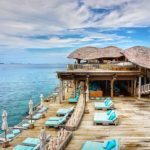 Villa One enjoys a legendary reputation amongst guests. 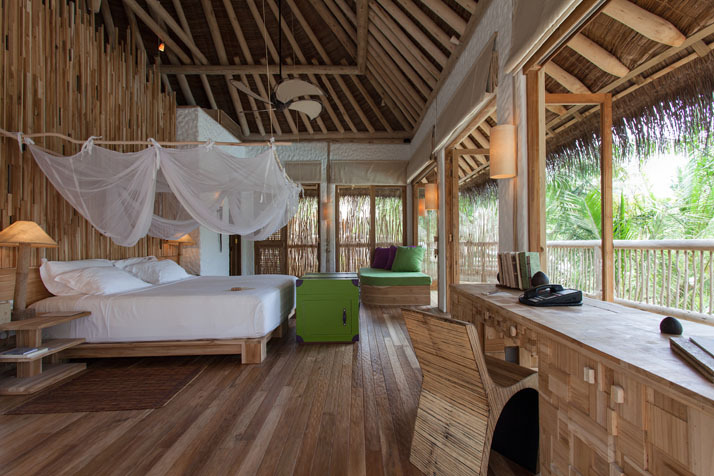 The luxurious three-bedroom escape is a luxurious playground of bamboo and other sustainable woods under a traditional thatched roof. 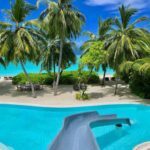 Explore dramatic indoor living areas and tropical open living spaces, romantic terraces, scenic decks, idyllic walkways and a huge private seaside swimming pool. 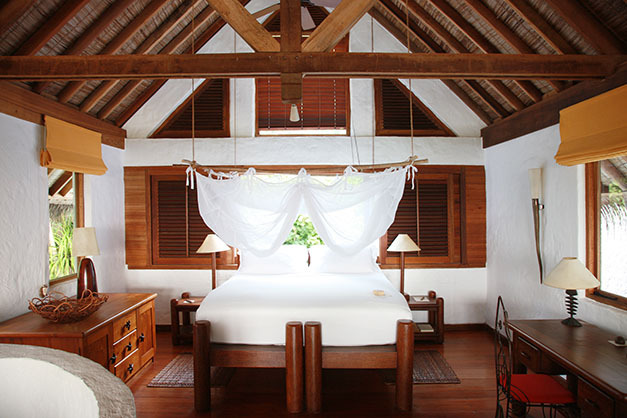 Feel at home…in paradise…in this rustic-chic residential style villa. 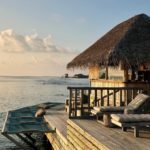 A vision in thatch, bamboo and sustainable woods, your family or friends will live out their castaway-style holiday in spacious indoor-outdoor living areas. Balconies and terraces. 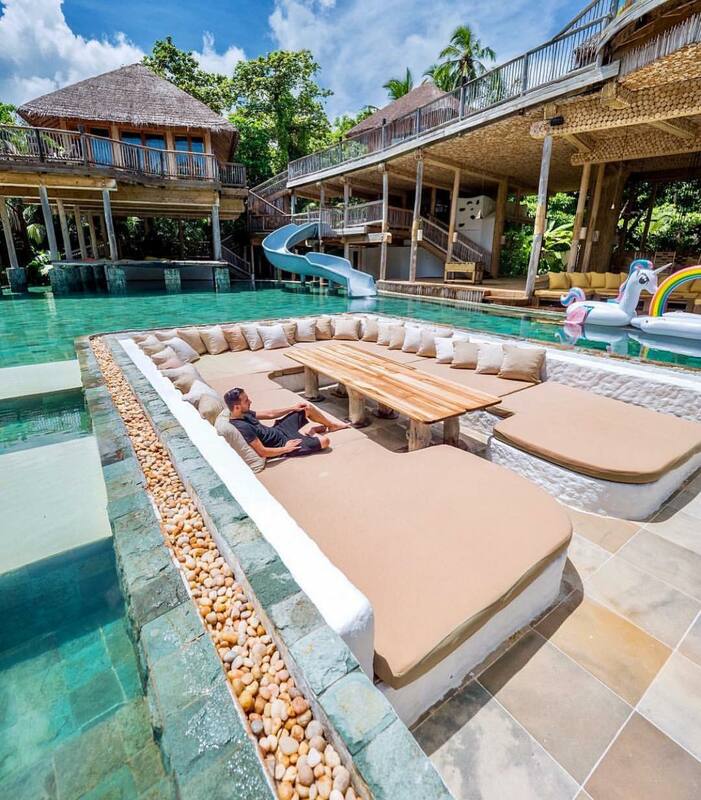 Daybeds and sun loungers. 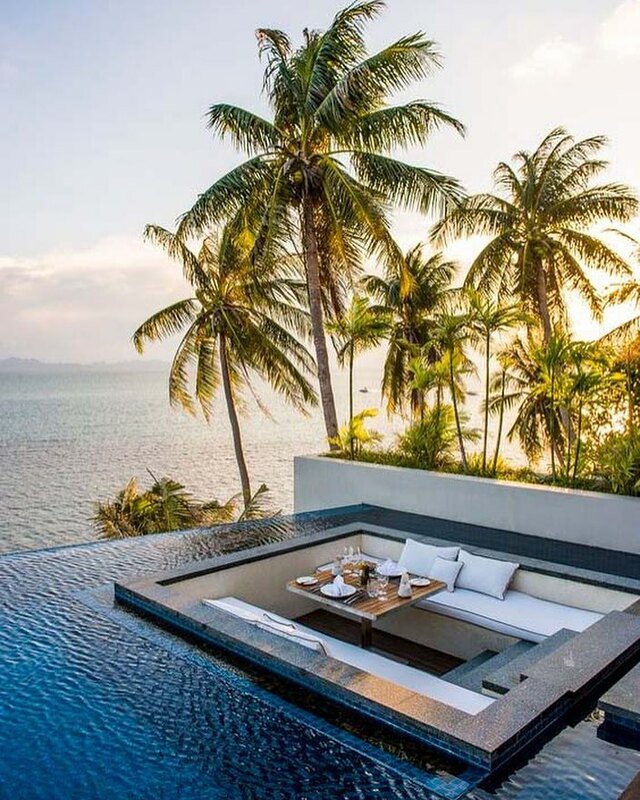 Soft cushions or the swinging hammock. Starlit bathing. 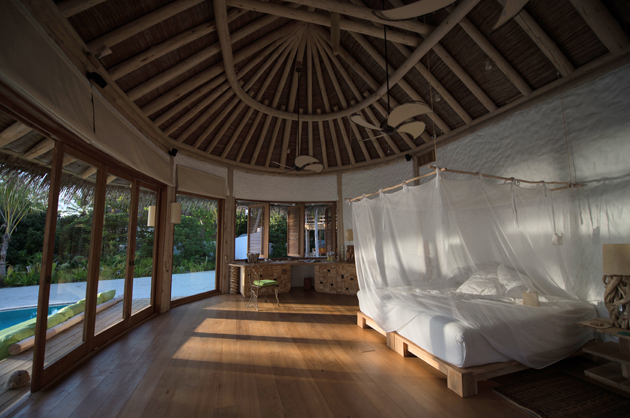 We offer you an expanse of spaces to while away the day, soaking in the sun or sheltering in shade. Your personal Mr or Ms Friday is on hand to cater to every wish. 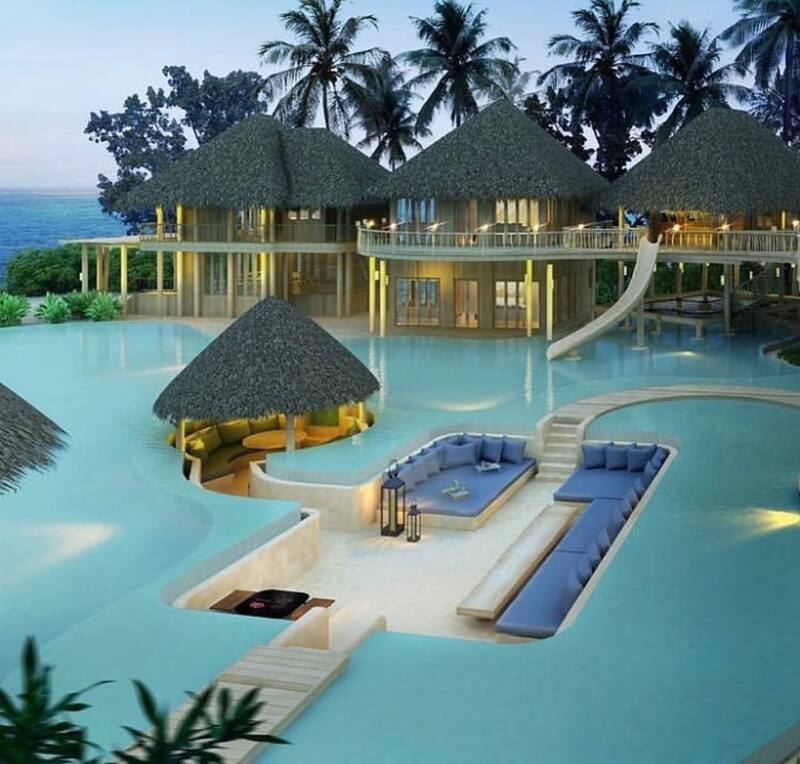 Our vision of a playfully luxe deserted-island mansion comes to full fruition on an oceanic scale in Villa 11. No luxury is spared. At the same time, you escape in a world of jungle fantasies with the palm-frond roofs, woven ropes and tree-branch banisters. 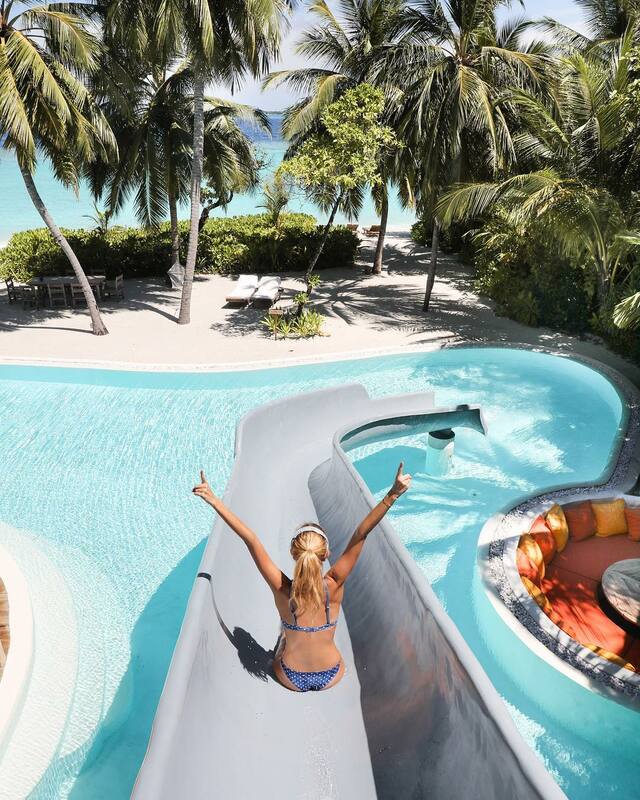 At the heart of the massive swimming pool, find an expansive deck that plunges you in the midst of the island playground. Spa, exercise, sauna and steam without leaving the forested mansion. 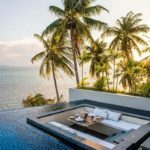 Host dinners in your sunken dining area, gaze out from balconies and gangways, or spend the day lazing in and around curves of the lagoon-style pool. 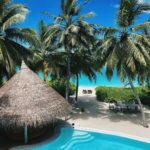 The lush jungles of our Maldivian island enraptured us. We loved feeling lost in their wilds as we wound in and out of the tree trunks, peering through leaves, listening to the rhythms of the canopy. And so we created this very special Jungle Reserve, a gargantuan villa engulfed by the dense green forest. The immense reserve surrounds you in nature while offering up caverns and terraces of luxurious space: three sumptuous bedrooms, huge open-air garden bathrooms, an indoor lounge with dining table for up to 10 and a separate outdoor sunken dining table just as large, an in-villa wine cellar, fully fitted-out kitchen, library, and your private spa suite with couple’s treatment room, gym, sauna and steam. 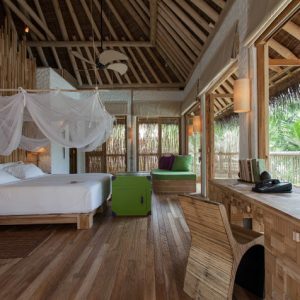 Tucked comfortably into the natural line of trees, these newly designed luxury Crusoe Suites give a modern twist to the Robinson Crusoe experience. 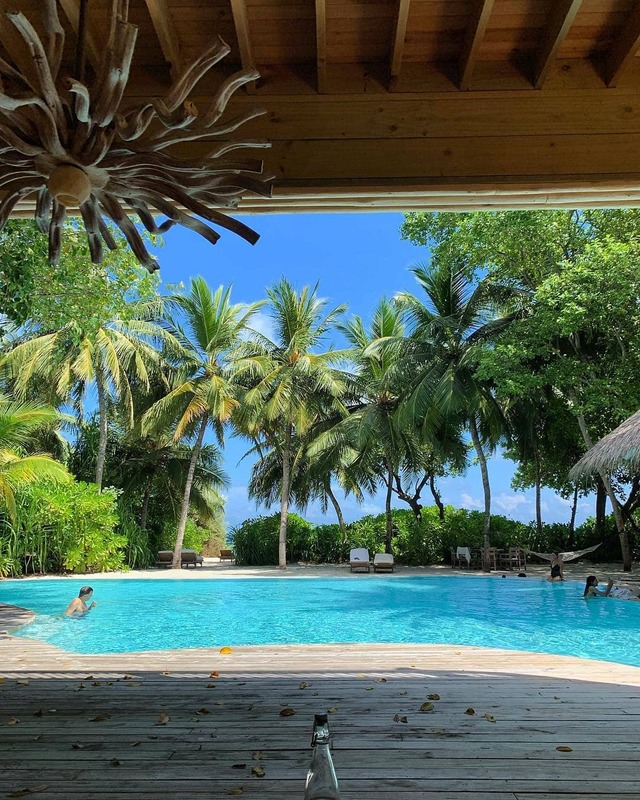 Maldivian Jungle surrounds, yet within touching distance of your own beach, or spend the day relaxing on the suspended seating area jutting over your sea water swimming pool. 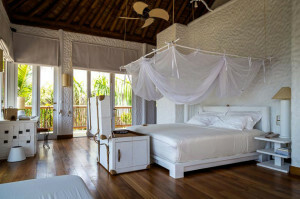 Our favourite part of this luxury villa suite is the observation desk, where you can bask in the beauty of the sparkling night sky from your very own plush daybed surrounded by lush views out to sea. 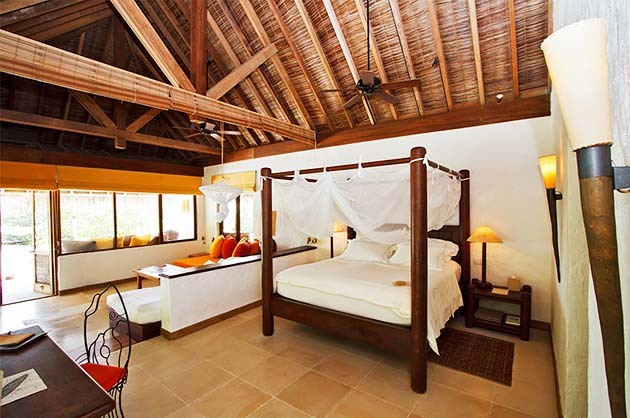 Your villa suite is located on the beach, with its own veranda leading to the inviting warm sand. The star of your spacious bedroom is the king-sized, four-poster bed with frames made with local coconut, while the open-plan living room brings the outside indoors with floor-to-ceiling glass windows. 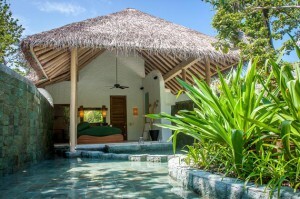 Revel in your luxurious open-air garden bathroom with water garden, outdoor shower, indoor shower and oversized bathtub. 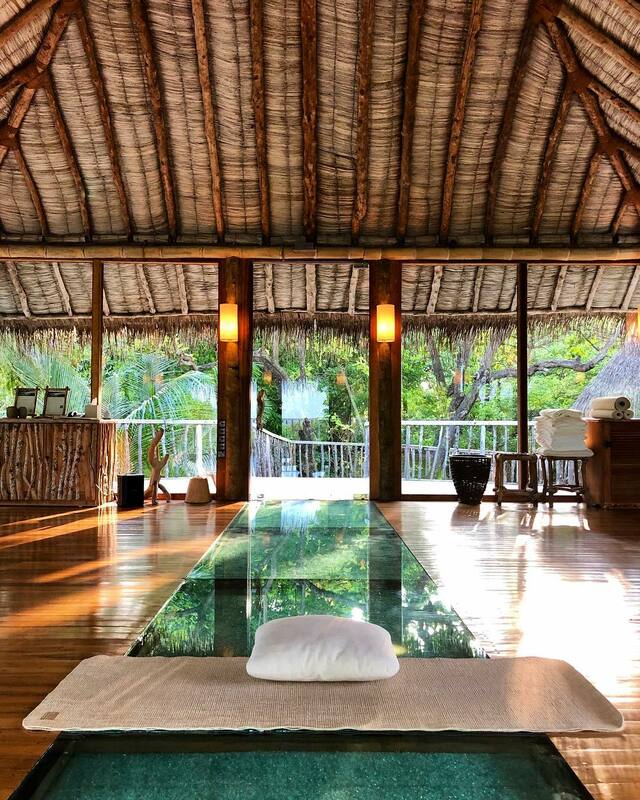 Natural simplicity. No unsightly clutter. 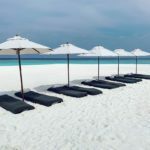 The freedom to relax mentally and physically. 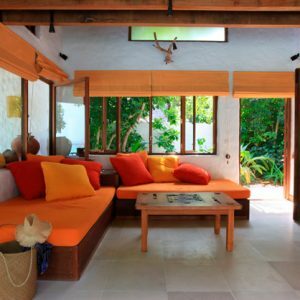 Tropical open living spaces complemented by calm indoor living. 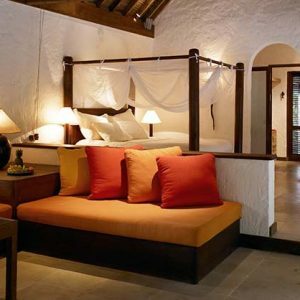 Two ground floor bedrooms have their own large open-air bathrooms, both with natural waterfalls, while the master bedroom comes with its own steam facilities. 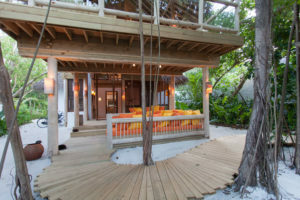 Expansive decks, idyllic walkways, your very own shaded plunge pool as well as a private seaside swimming pool, complete with a dedicated stretch of beach. Upper outdoor seating allows for evenings underneath the starry night sky, while lazy afternoons are best spent in the mezzanine TV lounge. 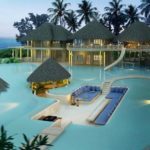 Further facilities include a kitchenette, open-plan lounge and dining area, private study, a personal gym as well as a yoga champa and a sunken dining sala. 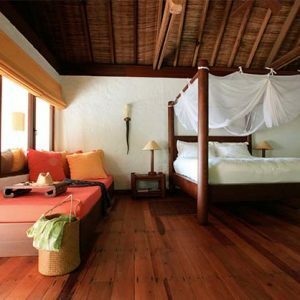 Our ‘sunset-side’ villas are only a few footsteps away from the island’s most vibrant snorkelling spots, as well as the lush tropical forest. 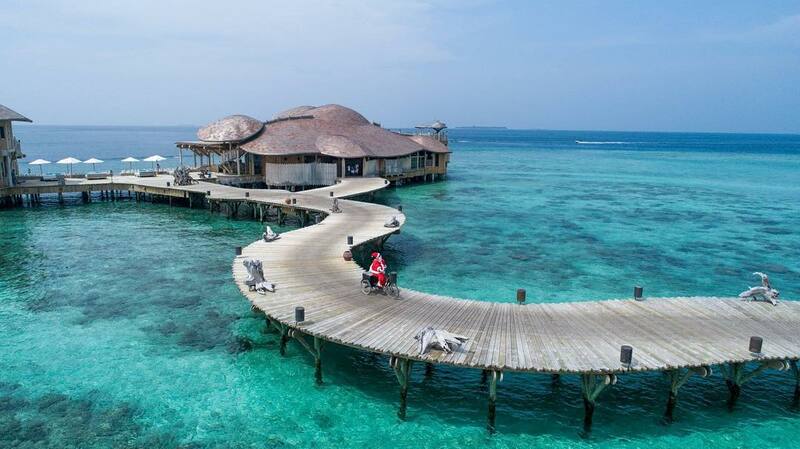 Privacy and seclusion, the perfect castaway holiday. Clean lines with a luxurious minimalist aesthetic. 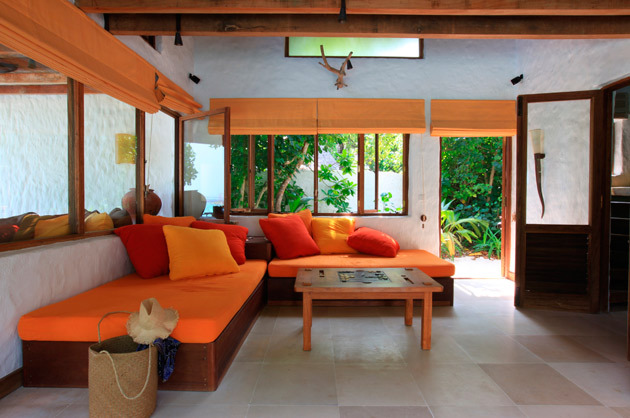 Space to unwind and relax amid exotic surrounds, complemented by tropical indoor-outdoor spaces. 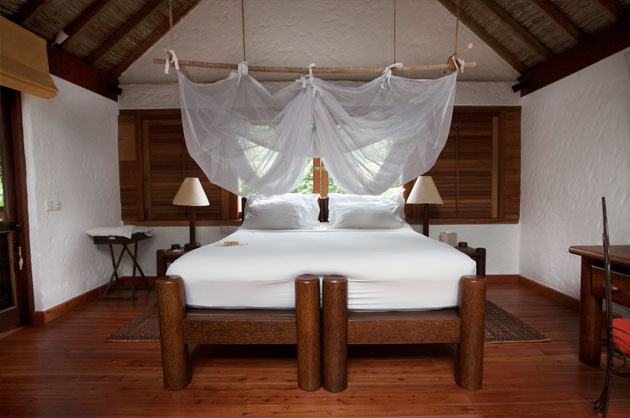 The private residence’s ground floor bedrooms come with spacious open-air bathrooms, accompanied by a beautiful natural waterfall. The generous master bedroom is ideal for quieter moments, perfect for basking in spectacular views of the setting sun, or indulging in your personal steam room. 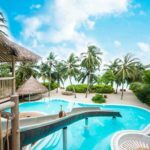 Stroll around your own residential hideaway and get closer to the lush jungle on expansive walkways and wooden decks, followed by a lazy day in the villa’s steam room and sauna, or your beachfront swimming pool. Inside the villa, you can enjoy a private wine cellar and a spacious lounge complete with large TV, as well as a kitchen with open-plan dining. 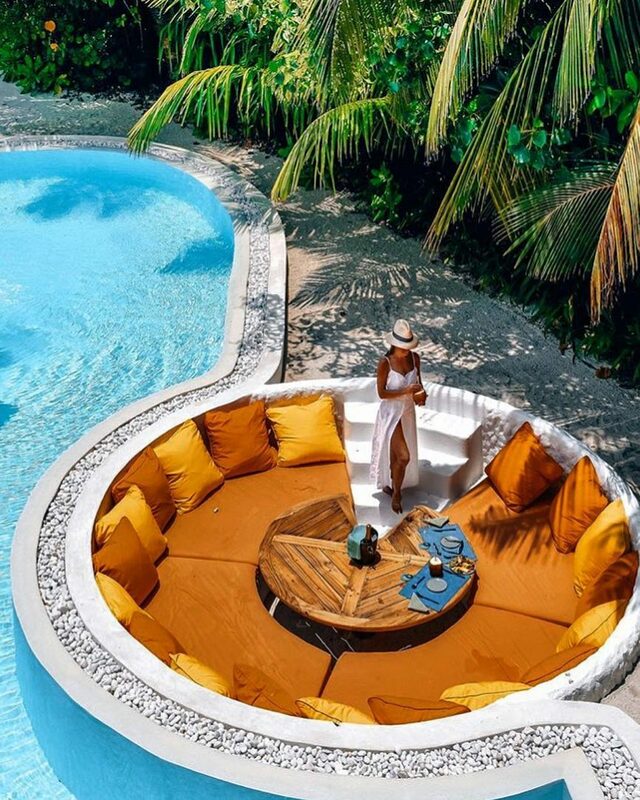 As evening draws in, the sunken dining area as well as large lounging sofas is ideal for intimate gatherings, taking in the quiet of a secluded retreat. 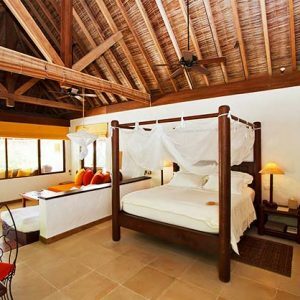 This romantic villa is the perfect luxury getaway for couples or small families. A separate children’s room, ideal for a teenage or two young children, offers additional privacy. Wake up in the king-sized, four poster bed made of coconut frames and enjoy the vista of sparkling blue water and ivory-white sand. Let the early morning sun warm your body over coffee in the upstairs observation deck before flopping into the plush daybed to catch up on your favourite novel. 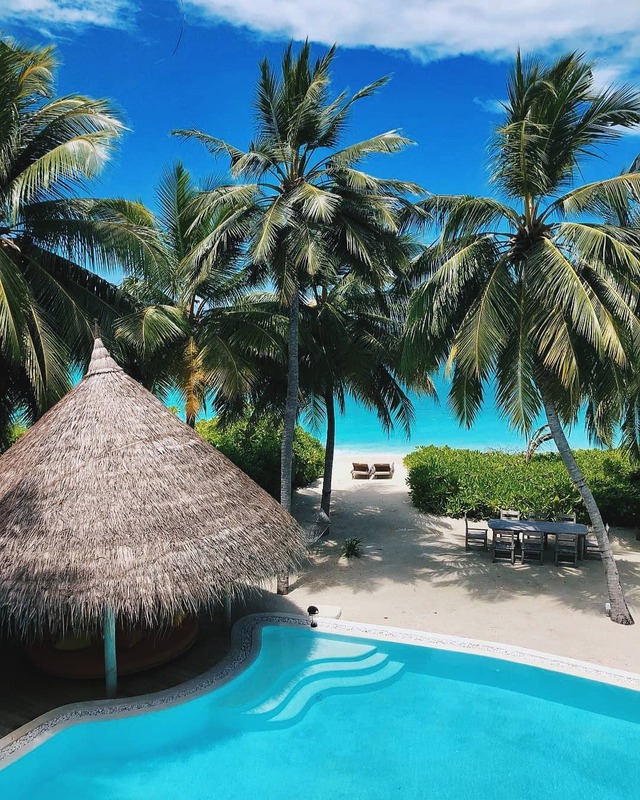 As your villa suite is located on the beach, take a few short steps across the veranda leading to the inviting warm sand before immersing yourself in the warm Indian Ocean. Or, stay indoors and relax in the open-plan living room that brings the outside indoors with floor-to-ceiling glass windows. Revel in your luxurious open-air garden bathroom with water garden, outdoor shower, indoor shower and oversized bathtub.